Sprawling yet little-visited Phou Khao Khouay National Park is located only 40 kilometres northeast of Vientiane, accessible via Route 13 headed to Tha Khaek. The park, which means “Buffalo Horn Mountain”, features some beautiful scenery and a vast array of biodiversity ranging from dense jungle to cool, misty pine forests, rivers and waterfalls, including noteworthy Tad Leuk and Tad Xay – both can be visited in a single daytrip. It is the closest National Park to Vientiane, but ironically it can feel like one of the least accessible to the average traveller. Sights within the park are sprawled out and the tourist heyday has come and gone, with many of the once highly touted activities and accommodation set up to be the next big thing now dead or crumbling. Still, the park remains an amazing swathe of nature less than two hours away from the rapidly developing capital city. The park is home to waterfalls, including Tad Leuk. Phou Khao Khouay National Park is most rewarding (and least frustrating) for those on an organised daytrip or with their own transportation – hire a driver, or if you’re a capable driver, rent a truck/SUV or a sturdy motorbike. Declared a Protected Area in 1993, Phou Khao Khouay covers 2,000 square kilometres spanning three provinces: Vientiane capital, Vientiane province and Bolikhamsay province. It stretches around 80 kilometres west to east, and 40 kilometres north to south, bordered by the large Nam Ngum reservoir/artificial lake in the northeast. There are several forest types – mostly mixed deciduous with some dry evergreen – along with a plateau, rivers Nam Gnong, Nam Mang and Nam Leuk which drain into the Mekong, the Ang Nam Leuk reservoir and a sandstone mountain range, with Phou Ho (1,671 metres) and Phou Sang (1,666 metres) being the tallest peaks. Lao villages and other ethnic groups such as the Hmong, Khmu and Yao are situated in the periphery of the park. There are only three villages inside the park itself. Information at Vientiane’s Tourism Office list the park’s “wildlife treasures”: white-cheeked gibbons, Phayre’s langur, civets, slow loris, the near extinct green peafowl, Malayan night-heron, fish eagles, grey peacock pheasant, Siamese crocodile and perhaps even a few Asiatic black bears remain. It’s suggested that treks and overnight stays with licensed guides can result in some wildlife spotting. The Ban Na Elephant Watch Tower and Homestay was set up in 2005 to give tourists an exciting chance to spot wild elephants in the park at night. 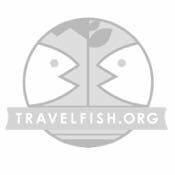 When Travelfish visited the park in February 2011, a sighting of two groups of elephants was reported and though we were not so lucky with an actual encounter, we saw plenty of evidence they were there. Today, elephants have not visited the watchtower for a few years. The Tourism Office still keeps a display about the Ban Na elephant watch tower and a homestay in the village is still possible, but it is clear there are no longer any elephants in Phou Khao Khouay. Wildlife spotting is best done in early dawn, dusk and at night, so an overnight trip in the park will yield your best chance of seeing animals though it would require a tremendous amount of luck. Located within a few kilometres of each other in the eastern area of the park, Tad Leuk and Tad Xay waterfalls in Bolikhamxay province, can be combined into one long day trip from Vientiane (2.5 hours driving in each direction). Large and grey, but not elephants. Tad Leuk is the most accessible sight in Phou Khao Khouay. It’s a family-friendly waterfall popular with locals as a weekend picnic spot. The Nam Leuk river is a pleasant spot to cool off from October to April, when water levels and flows are gentle enough that you can swim or hang out on one of the wide, flat sandstone rocks, but the waterfall itself is prettiest in rainy season (approximately June to September), when the six-metre falls are raging, butterflies dance in the air and the trails are lined with a sensational display of orchids. Do not attempt to hike the trails at Tad Leuk alone. If you plan to wander any amount of distance away from the falls, organise a trek through Green Discovery or try to hire a local guide at the village (approximately 100,000 kip per one to three people). We know of two separate incidences of people who followed a trail at Tad Leuk and got lost in the jungle, spending a harrowing night before very luckily being found. We recommend Tad Leuk as a day trip, leaving before dark, rather than an overnight stay. Tad Leuk has a visitor centre but expect nothing but very basic facilities and don’t count on being able to get food. Much has changed from when we first reviewed this sight in 2008, when camping in the great outdoors was encouraged in park tourism brochures. We’ve received reports of people who were told they couldn’t bring their own tents and sleeping bags and it was mandatory to rent them, however the equipment turned out to be dirty and broken. They were not allowed to sleep outside and made to sleep inside the building on the floor. It sounds like a less than stellar experience. To get to Tad Leuk, with a sturdy vehicle or motorbike, take Route 13 South and at Km 90 (meaning 90 km from Vientiane) just before Thabok, turn left. Follow the road five kilometres to Ban Houay Leuk, and following the signs, continue for a kilometre, turn right crossing an iron bridge over the Nam Leuk river. It’s another five kilometres to the park checkpoint where you pay admission (5,000 kip per person). The beautiful journey to Ban Pako. From the checkpoint, continue three kilometres, then turn left at the sign for Tad Leuk. Then it’s a final four kilometres. The last stretch of roads to the waterfall is rough and difficult, especially in rainy season, and a guide or an organised tour is a good idea during this time. Be prepared for a combination of a bumpy ride and walking to get there. In the same area of the park, the twin falls of Tad Xay is arguably more spectacular, as the Nam Mang cascades over a series of tiered steps before flowing 800 metres through a valley and plunging over Pha Xay, a 40-metre cliff, into a gorge. There’s a good chance you’ll be alone if it’s not the weekend. Like Tad Leuk, the best time to visit is October to May, as rainy season (June to September) morphs the falls into a force of nature and it becomes a challenge to reach. Swimming is possible year round at the bottom pool of the smaller falls. To get to Tad Xay, follow the same instructions for Tad Leuk to the bridge crossing over the Nam Leuk. Pass the village of Ban Hatkai and continue seven kilometres through the forest (note: the road will be rough and in rainy season, muddy and slippery). For a more adventurous journey to Tad Xay, take a 45-minute boat trip from Ban Hatkai followed by an hour hike to the waterfall. In theory it can all be arranged on the spot at Ban Hatkai. Costs: boat 80,000 kip or more (depending on number of people and price of petrol), local guide 100,000 kip for one to three people, permit 50,000 kip per person, possibly village fund fee 50,000 kip per person. 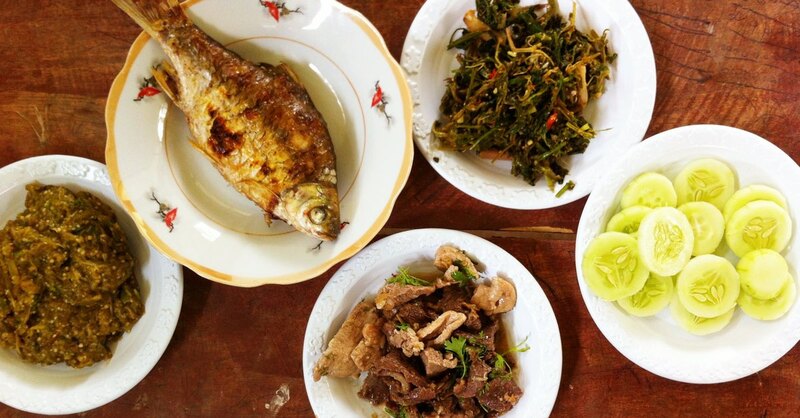 If you are determined to stay close and not feel rushed in a day trip, you can do a homestay in Ban Hatkai. Here you can experience rural life in a quiet, spacious village with open, grassy pastures and a riverside temple. You would stay with a local family in a traditional open-plan Lao house. There is very little English spoken and without a translator/guide, you can’t expect it to be much of an interactive experience. You can expect a roof over your head, clean bedding, mosquito net and a home-cooked meal. The homestay was set up by an NGO as a “community-based project,” a popular phraseology that essentially means you will have to pay a bunch of different fees so that everyone benefits, or at least it appears so. Price per person: homestay 30,000 kip, a meal 30,000 kip, village fund 50,000 kip, park permit 50,000 kip. Arrange the homestay in advance, call Mr Khamoune or Mr Bounthiang at T: (020) 224 0303. To get the most out of Phou Khao Khouay NP, we recommend going with an outfitter such as Green Discovery, especially considering the issues we’ve outlined about logistics, getting there and getting lost. Green Discovery offers one- to three-day treks and multisport adventures. Their one-day “Phou Khao Khouay Challenge” includes three hours of cycling and trekking around Tad Xay and two hours of kayaking. Those looking for a challenging cycling trip, their full day “Vientiane Cycling Retreat” covers rice paddies, rivers and villages. “Nam Leuk Nature Adventure” has you camping on the riverbanks and long days of hiking. Staying overnight in the park gives you the best opportunity for bird and wildlife spotting. All camping equipment is included. Price works on a sliding scale, more people decreases the price per person. For instance, the Phou Kha Khouay Challenge, based on four people, is US$103 per person. 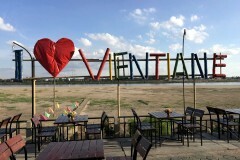 Vientiane Cycling Retreat with two people is US$109 per person. Green Discovery posts upcoming departures you can join on the Vientiane page of their website and on a chalkboard in front of their sales office on Sethatirath Road, in the tourist centre directly across from Joma Bakery Cafe and Benoni Cafe. Open 08:00-12:00, 13:00-22:00. Call them on (021) 223 022. Another way to experience Phou Khao Khouay NP is by spending a night at Ban Pako Eco Lodge (sometimes listed as Ban Lao Pako), 50 kilometres from Vientiane. This lodge gains its “eco” epithet from its striking location in the southern edge of the park, on the banks of the Nam Ngum river. The location and lovely scenery is, unfortunately, the only thing Ban Pako has going for it. This once recommendable resort is in a very sad state and eerily deserted. You can tell that a lot of investment was initially put into the place. It has an open-air restaurant perched on the banks with a marvellous wide view of the Nam Ngum, solid wood tables, fine dinnerware and cutlery, a nicely constructed bar. We don’t know when, what happened or why but it has gone downhill and now it is lacklustre and very tired. Pathways are overgrown, fences downed. It feels like there was a nuclear scare and the place had been abandoned quickly. We were the only guest when we stayed in June 2015. There were three staff members, a Swedish man who we never saw again after we arrived and a service man and a woman with very limited English who took care of the meals. It’d be repetitive for us to describe in detail how the once fabulous solid wood bungalows with attached bathroom were very, very tired and suffering from termite damage. The only thing worth mentioning is the bungalow’s front veranda, which is the best part about it. You do get an amazing river view, plus a hammock and an overhead fan to lounge for hours staring at the river, because that’s all there is to do. Like the place itself, the website is frozen in time and the information is out-dated. Don’t count on any guided treks, traditional sauna, tubing, temple visits and kayaking that it lists as available activities. The free minivan shuttle from Vientiane is also non-existent. Luckily, getting there on your own is the best and most interesting part of the whole experience. When making a reservation ask them to arrange for a boat to meet you. From the central bus station (at Talat Sao/the morning market) take bus #19 at 11:00 sharp – as of 2015 it’s the ancient blue and white beasts, a truly local bus experience. Station staff are helpful in directing you to the proper bus, or you can ask your hotel to write “19” in Lao for you. Don’t believe tuk tuk drivers telling you the bus has already left. Costs 10,000 kip, pay the driver directly when he asks for the fare. Take the bus to Ban Somsamai (1.5 hours) where a boat should be waiting for you at the landing. From there it’s a beautiful 30-minute journey on the river to the lodge (60,000 kip). Who is Ban Pako Eco Lodge for? Those who don’t mind spending money for some quiet alone time in nature and in dilapidated accommodation. This is not for people who are afraid of insects and geckos. If they had lowered prices to attract budget travellers, we’d actually go on a limb and suggest this is not a bad place for backpackers to chill out. But the room rate is an outrageous 230,000 kip, plus you’re stuck eating mediocre meals at the lodge (not surprising, most menu items are not available). Not even breakfast is included. If you do decide to go, we recommend you have company. We’re resilient independent travellers, used to being alone and with nature, but admittedly we were quite spooked by how quiet and deserted the place felt, especially at night when all but one staff goes home.